This versatile cake makes a great packed lunch addition or can be served dusted with icing sugar as a dessert cake if wished. Rhubarb can be substituted for apples. 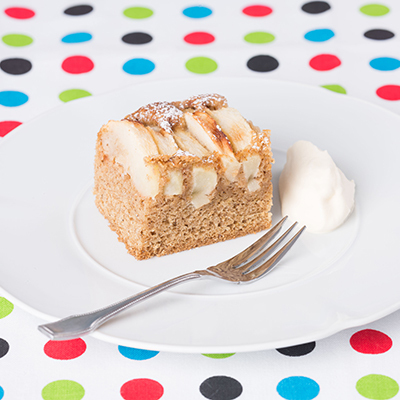 You will need about four stalks to make your Spiced Apple Cake. Melt the butter in a mixer bowl or saucepan large enough to mix all the ingredients. Beat in the sugar and eggs until combined. Mix in the DYC Apple Cider Vinegar. Sift the flour, baking soda, mixed spice and ground cloves together and add to the butter mixture. Beat until nearly combined then add the water beating until smooth. Spread the mixture into a 20 centimeter square baking paper bottom lined cake tin. Cut the apples into quarters, core and cut each quarter into four. Press the apple slices into the surface of the cake mixture. Bake at 180 degrees C for 45 – 50 minutes or until an inserted skewer comes out clean. Cover with a clean cloth for 10 minutes before turning onto a cooling rack.